Earlier this week, Tony gave high remarks to the Tatuaja Black Label Corona Gorda. 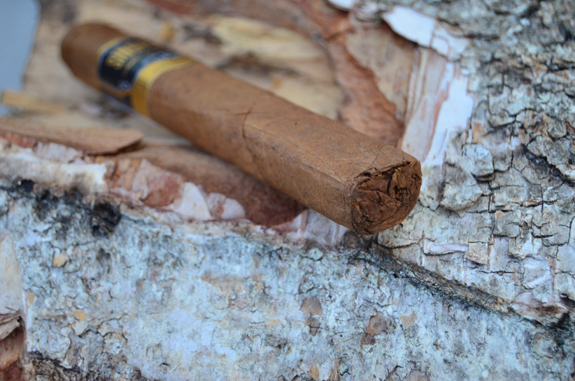 Keeping to the theme, I bring to you a review of another Corona Gorda, the Sindicato by Sindicato Cigars. 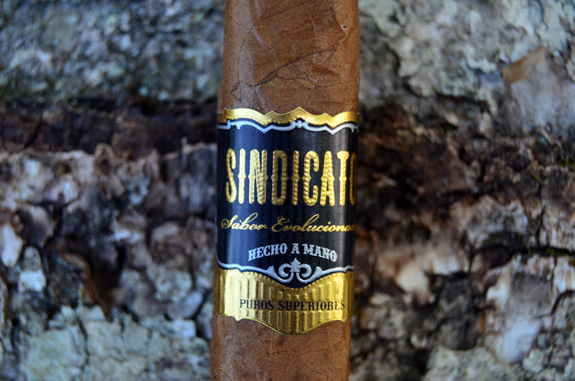 Sindicato Cigars is a relatively new company that first launched their cigars at the 2013 IPCPR trade show. 2013 releases included Affinity, Hex, and the value-priced Casa Bella. Check out Tony’s review of the Hex here. Blended by Arsenio Ramos at the Casa Fernandez factory in Nicaragua, the Sindicato is available in six vitolas: Corona Gorda (5 1/2 by 48), Robusto (5 by 54), Toro (6 by 54), Belicoso (6 1/8 by 54), Churchill (7 by 52) and Magnum (6 by 60). 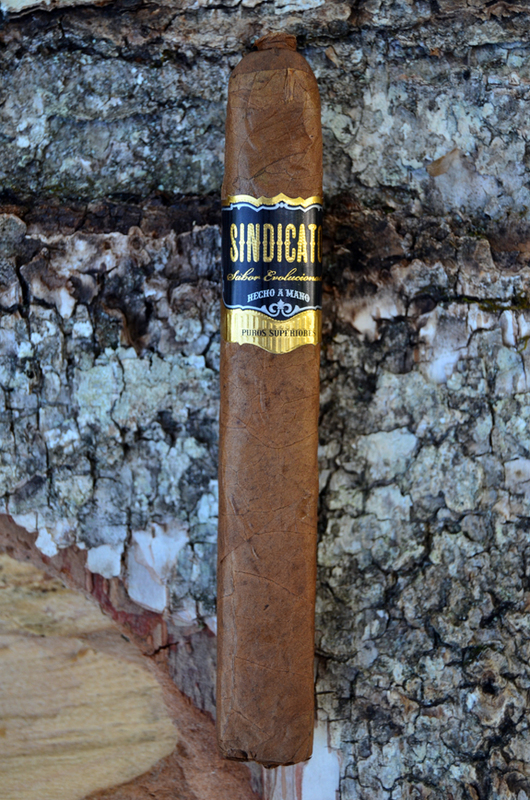 The Sindicato began to hit shelves in May 2014. Sindicato is a square-pressed Nicaraguan Puro crafted with a limited, shade-grown Corojo wrapper from Eduardo Fernandez in Jalapa, Nicaragua. This beautiful wrapper is grown under shade to ensure the leaf’s consistent appearance. Master blender Arsenio Ramos has combined this unique wrapper with a rich, bold Estelí double leaf binder, which encompasses a blend of strong, flavorful Jalapa and Estelí leaves and delivers a medium-full strength cigar with exquisite taste. As I begin to examine the Nicaraguan Corojo wrapper leaf that is medium brown in color, I immediately think of a Padron Anniversary due to its rustic quality. 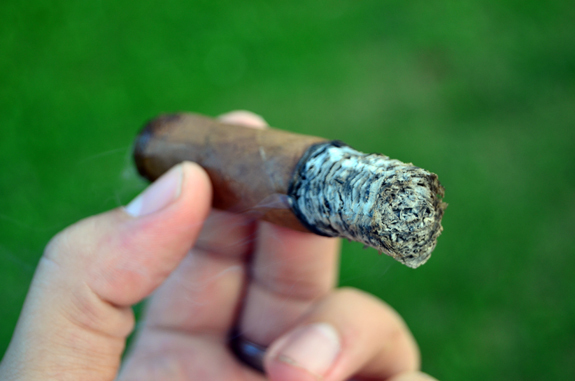 The natural characteristics of the leaf are apparent with tons of veins webbing across the cigar, color imperfections, and water spots. However, the wrapper remains smooth to the touch. The wrapper has a very faint aroma of some sweet tobacco notes accompanied by black pepper. The shaggy foot gives off notes of cedar and black pepper. The cigar comes to a close with a swirled pig-tailed cap. Upon clipping the cap, I find a perfect draw that is showing off some rich cedar notes and a crazy, unique artificial-like fruit candy sweetness. The Sindicato begins with a creamy texture similar to the sensation you would get sucking on a Werther’s Original. The flavors are medium-full highlighting a balanced bouquet of flavors. One thing about cigars that are really well-balanced is I have a difficult time pinpointing specific flavors. In the first inch, the only discernible flavors are of oak and pepper, along with a slight tartness. The pepper stands out on the retrohale but is not overpowering. There is some sweetness that is rounding out the darker edges of the smoke. I am not sure if it is because my mind is stuck on butterscotch or what, but there may be some vanilla and caramel sweetness. At the close of the first third I am already feeling a small amount of nicotine. 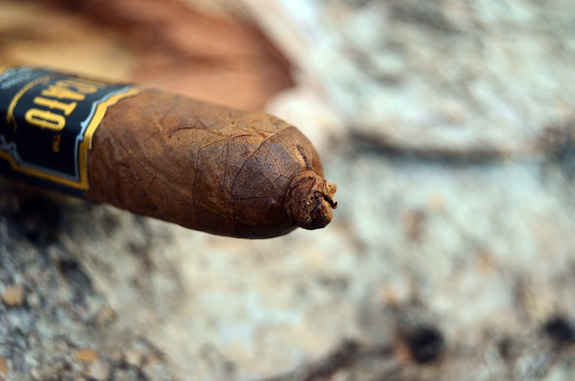 For a cigar of its size, the Sindicato is burning slow and cool, which is just fine with me. It is just so dang good I don’t want this cigar to end. There has not been much development in the profile except for some toasted notes and some dusty cocoa that is now on the finish of the smoke. The thick, eyeliner burn is trucking along that has been wavy from the start. But so far, no need for a touch-up. The richness I noted on the cold draw is now front and center as I burn into the last third of the Sindicato by Sindicato Cigars. The toasted notes that entered in the middle third are still holding strong, the cocoa has gained ground, and possibly some black tea has shown up. I am still enjoying the heck out of the creamy mouth feel that just add so much to the stick. The smoke production is just awesome, each small draw fills my mouth with flavorful smoke. The strength has not changed much from the start but along with the flavors it is right at medium/full. Great review. Love that flavor profile!